Run on Saturday mornings 9.30am - 11.00am at Wateringbury Village Hall. Come and join this sparkling group of kids for a morning of fun and creativity, learning skills and techniques to build imagination, ability and confidence in the exciting world of acting. This fun, no pressure class covers a wide variation of challenging and creative activities including vocal skills, improvisation, characterisation, tv and microphone techniques, mime, confidence building games and much more. Please note that whilst we may include some music, movement and singing within the classes the focus in this group is on acting and drama. Free taster session and discount available for siblings. Run on on Saturdays from 11.00-12.30pm at Wateringbury Village Hall, Kent for 15-19years. A more challenging class for those with a bit more confidence and looking to embark on a career in the arts. We explore improv techniques, apply vocal diversity and look more into the human condition to understand why we behave the way we do. Using this understanding we create characters and stories that connect. Run on on Saturdays from 11.00 -12.30pm at Wateringbury Village Hall, Kent for 12-14years. This class will cover a more in depth study of drama in a relaxed,fun and supportive environment, inspiring young people to engage with each other and themselves. They will learn to become more confident as individuals, improve their diction, use texts and scripts as well as their own imagination. Other skills taught include tv and radio technique, role play, comedy, audition techniques, improvisation, movement and much more. 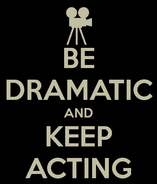 We aim to provide interesting and inspiring sessions whilst expanding the young actor's knowledge of drama and language as they explore their craft. As a Member of LAMDA we can prepare people of all ages for the internationally recognised LAMDA qualifications. LAMDA is one of the UK’s oldest and most respected awarding organisations. It has been offering practical examinations in communication and performance subjects for over 130 years. In this time, their qualifications have helped hundreds of thousands of candidates of all ages and abilities to develop lifelong skills. LAMDA exams are about achievement – recognising and rewarding the endeavours of each individual – but they are also about empowerment. The ultimate aim is to provide all people with the opportunity to develop the life skills they need to be a success: attributes such as self-confidence and the ability to communicate clearly and present ideas. At the heart of LAMDA examinations is the recognition that the qualifications are for everyone.